There is a clear line of demarcation in the world of mass-communication, and odds are, you are on one side of it or the other. Do you Tweet? Do you Pin? Have you ever posted a video on Vine? Perhaps not. But surely you are on Facebook and LinkedIn. If not, your business may be mired in the old-world marketing practices of the 20th Century. And yes, it is the 21st Century—it has been for 14 years now. And as much as those social media obsessions of your children may annoy you, successful B2B sales organization are harnessing those mediums to elevate their profiles and significantly boost their sales. And recent statistics that indicate that nearly 45% of all online purchase are made from a mobile device should make it very clear…it’s time to get on board. If you are of a certain age or temperament, the concept of tweeting or divulging every mundane event of your day on Facebook is probably as alien as reading a book on your computer. Hmm…you may be a little behind the times. But let’s take a crash course here to get up to speed. LinkedIn If you don’t have a profile there yet, do it today. The standard free membership provides basic contact and information services, but LinkedIn’s paid membership unlocks substantial research and outreach capabilities for identifying robust business leads and communicating with key movers and shakers. For some helpful tips on maximizing LinkedIn benefits, visit this previous post. Twitter If you avoid the all-too-common misuse and overuse of Twitter that seems to plague the masses, it’s the best and most efficient social medium to expand your reach and connect with other kindred spirits. It’s also the best means to listen and learn what your potential customers are interested in, what type of solutions they require. Use Twitter to send out periodic bursts of communication to promote your more substantial content marketing efforts, such as blog posts, webinars, company and industry events, and more. Depending on the nature of your business, you should be able to dream up provocative questions and comments to “tweet” that should address your target audience’s potential needs and concerns and, in turn, start up a dialogue. Some of this kind of content is referred to as micro-blogging. It should always drive traffic to your website. YouTube The popular video channel has become a powerhouse in social media. And the ease with which you can post videos to YouTube and then embed them in your own website made the channel a no-brainer for business marketing. Build a library of informational videos, tutorials and “How-to…” guides and archive them in your own channel on YouTube. Be sure to name your videos in search-friendly terms as the collateral value of appearing in Google, Yahoo! and Bing engines will result in new streams of traffic and previously untapped prospective customers. Google+ has established itself as the second-largest social media site in the world and boasts a monthly active user base of 235 million. Conceived as a rival to Facebook, what chiefly differentiates it is the transparency and ease in seeing how others share information and interact. Some of the products that Google has built into the platform, such as Hangouts and Communities, along with its added integration in Google News allow B2B businesses to monitor referrals and sharing of their content. Facebook Even companies with robust, interactive websites recognize that Facebook is the hub of communication for virtually everyone under the age of 30, and a very large minority of people past that tender, young milestone. Tens of thousands of small-to-medium B2B enterprises utilize Facebook as their chief external marketing vehicle, rolling out posts on new products, company news and sales incentives. Whenever you’ve got new content on your website—a blog post, an announcement or a media event (webinar, podcast, etc. )- post a teased link for it on Facebook. Try and accompany these with an appropriate photo –original or stock- as it carves out a slightly bigger portrait on your “friends” crowded pages. And, of course, on your own website and in newsletters and social media, encourage visitors to “Like” you on Facebook. Every little bit helps. Instagram is an online photo & video sharing, social networking service that enables its users to post images and share them on a variety of social networking services, such as Facebook, Twitter, Pinterest and others. On its own, or interfacing with other social media, as users started touting companies and products they liked, posts went viral and started driving referral traffic to favored retails and brands. 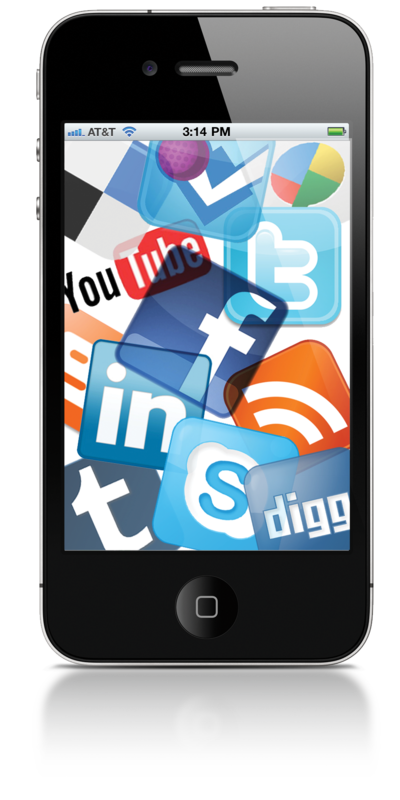 Social Media is primarily a phenomenon borne of the mobile device. But with the advent of the iPad and its many copycats, tablets are blurring the barriers between the desktop and hand-held experience. Very soon, almost everyone will be enjoying a fully-enabled mobile web experience. Harness these social media tools now and integrate them into your content marketing strategies for they are the gateways to your business future.